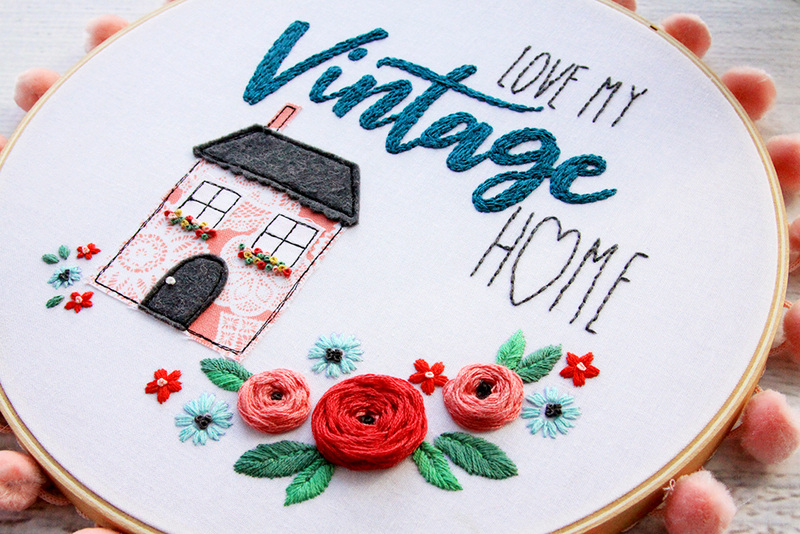 I’m so excited to start sharing Vintage Keepsakes projects! 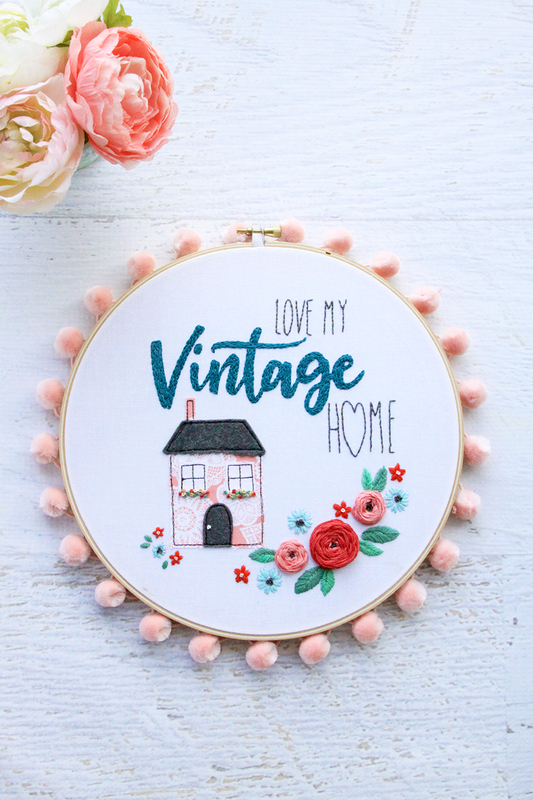 And I felt like this Love My Vintage Home Embroidery Hoop Pattern was a great place to start! 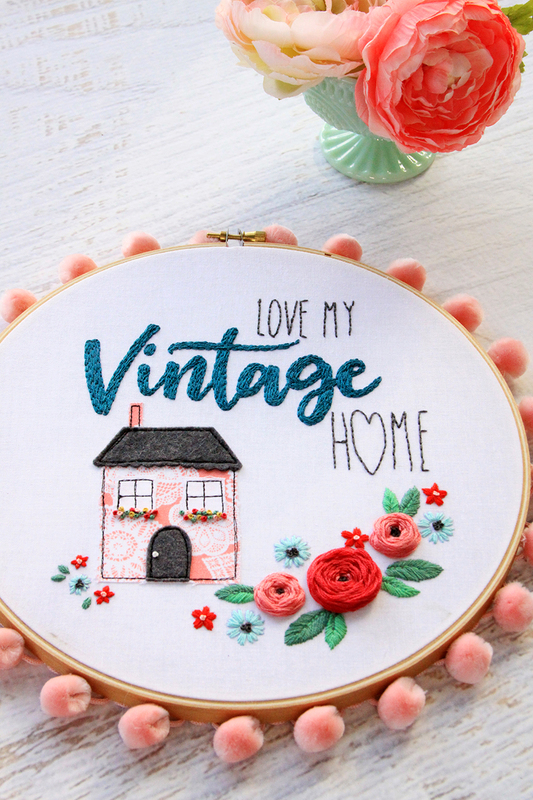 It’s kind of a great summary of Vintage Keepsakes – I love collecting vintage things and filling my home with them! 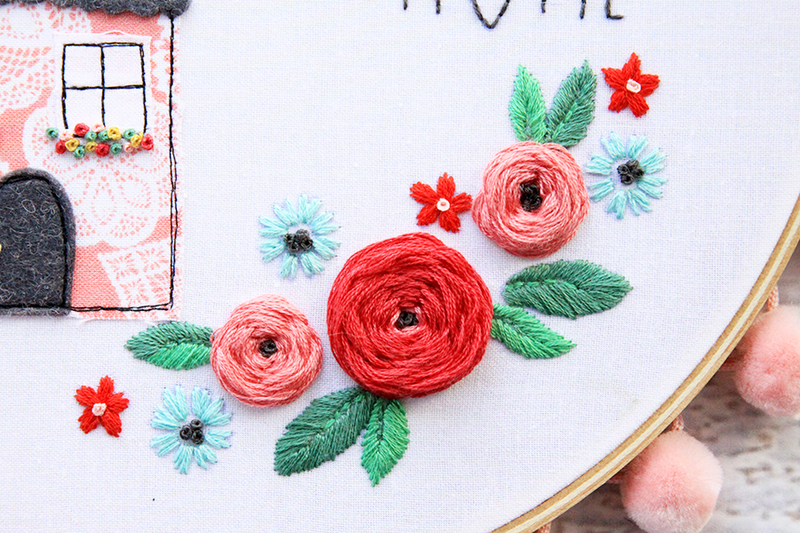 The hoop is a fun mix of fabric, felt and embroidery. The combos give it such great texture with all the little flowers and embroidery stitches! Trace the pattern for the embroidery (lettering and flowers) onto the background fabric. Using the pattern, cut out fabric pieces slightly larger than each pattern piece. 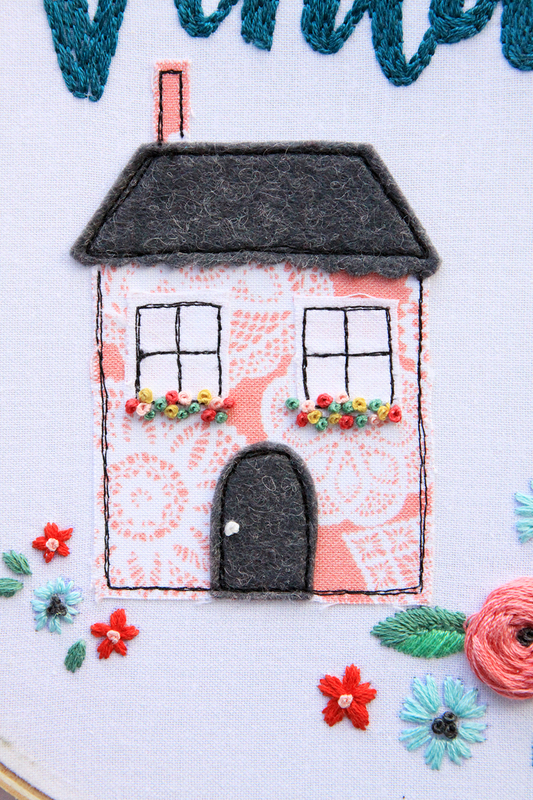 The house and chimney should be fabric, the roof and door should be wool felt. (Polyester felt will melt to your iron so i don’t recommend it.) Iron fusible webbing to the wrong side of each piece. Cut out the pieces using the pattern. Iron the pieces in place on the background fabric using the pattern as a layout guide. 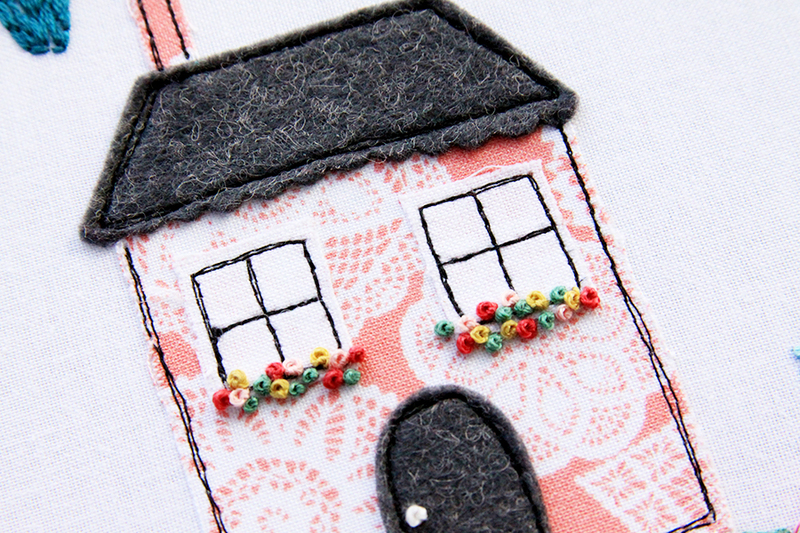 Sew around each of the pieces using the black Aurifil thread, two or three times to give the thread a sketchy/outlined look. Place the fabric in the embroidery hoop, tighten and begin stitching! 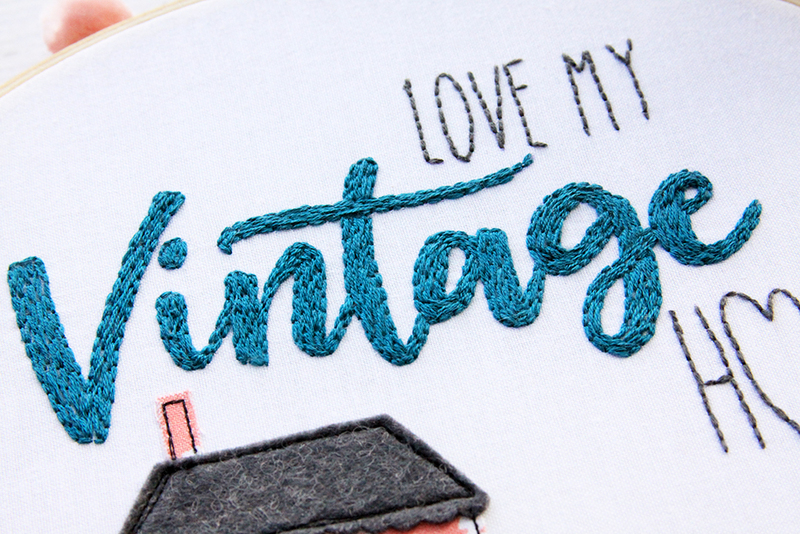 Vintage – Outline the letters with backstitch, then fill with a layered backstitch. Finish your hoop by trimming the fabric to within 1/2″ of the outside edge and glue the fabric to the inside of the inner wood hoop. Add your pom pom trim around the edge to finish it off. Or you could use the pattern another way! Wouldn’t it look darling as the center of a throw pillow?! You could add a little patchwork border around the edge too! I absolutely love your embroidery work! Actually, I love everything about this project! Beautiful stitchery! Thank you for sharing! This is SO cute! Love it! Your work is so pretty and precise. I haven’t embroidered for at least 40 years. 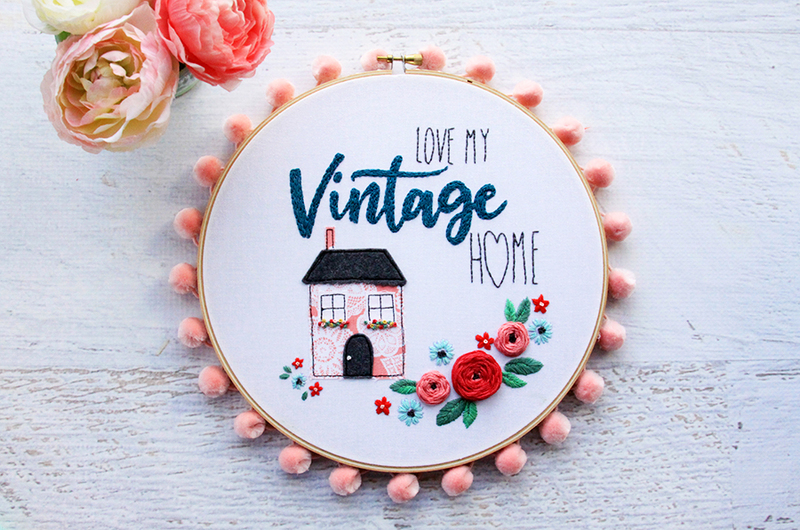 Don’t think I have the patience anymore but sure do love this project… and the pink pom poms around the hoop just make it even more darling. I WILL save the pattern, “ust in case” I pick up an embroidery needle again!